Ok, many of you know I've been interested in these for a long time and have had trouble figuring out just how many. I've heard different numbers with 20-30 being the highest. I wonder if we could use this group as a starting point...perhaps figure out by serial numbers. If you have one...post em if you got em! This gold bass has 1165 on the gold tag where the serial number is and on the harp has a stamp of RJ1567. I'm not sure what this means...perhaps made in 65, `11th week? Maybe the stamp means made in 67? I'm not sure. I definitely want to get to the bottom of this. Of the ones I"ve seen, different name rails, hardware and finish on cheeck blocks have been found. Let's list this info and see what we come up with. and here's a pic of course. is output jack centered with the pots or to the far left? Cheek Blocks: wood painted black or wood stained to natural color? Post a pic if you have one! 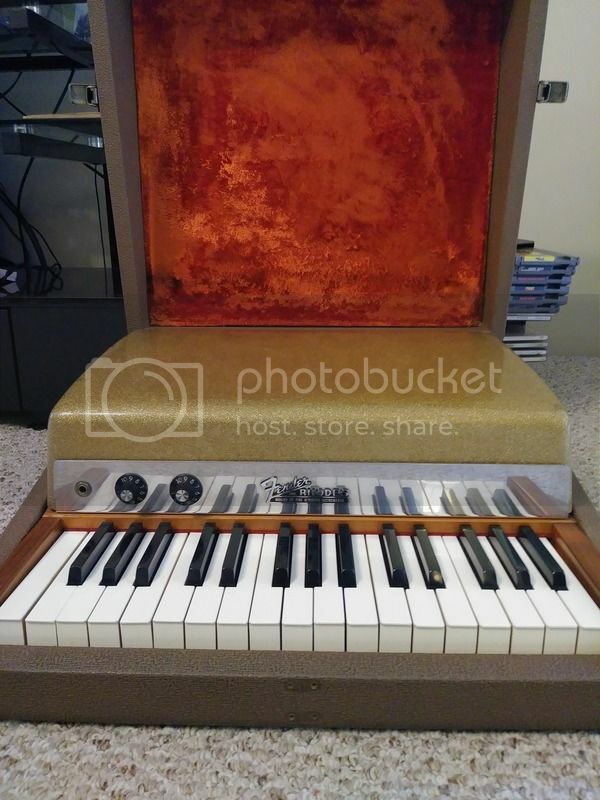 I just purchased the Gold Sparkle Piano Bass that was recently listed on Ebay. I'd mentioned this in the "buying" category where you were discussing it when it was listed but then I saw your production survey thread. I've been trying to buy one of these for about 10 years and was starting to think it would never happen. On the gold label under the cover the model # is BA 0196 but under the harp it's rubber stamped "9 66." I'm assuming that means the 9th week of 1966? The keys are wood under the white plastic ( which is different from the all plastic keys of my silver sparkle from the same year), the blocks are wood. I'll get some pics of it up within a day or two. I'm new to the forum but once I purchased this I had to tell someone who cared. Okay, finally got a chance to take some quick photos of the gold top. I wonder if the one in the Doors movie is an authentic or a reproduction? It looks real. Hey Eminor! Congrats. I saw that one on ebay and was so surprised it took lo long to sell. It's a sign of a bad market I guess,but you got a great piano bass there. I'd hang on to it for sure. I needed cash and was very close to selling mine...so glad I didn't! That's like the Doors holy grail right there! I love jazz, blues, funk, soul and classic rock! I noticed it's been over 3 years since anyone's had anything to say about the Gold Sparkle Piano Bass. Here are a few Youtube vids I made utilizing the bass for Doors tributes / tutorials. Maybe this will spark some more conversation or drum up a few more owners. Enjoy. I managed to purchase another gold piano bass this spring. In great shape and full Manzarek spec with the shifted over 1/4 Jack and name rail slightly less chromy than what you see on 66 models. I tried to post a pic and they wouldn't attach. I may try again later. No serial number as the gold tag is gone,but I suspect it's a 1965. Ok, here are pics. All original. Aside from some screw holes remaining after removing a bracket the previous owner installed on the case, it's in exceptional condition for its age. There were 2 medium sized surface cigarette burns in the gold top, but Novus 1-2-3 polish took care of those in short order. Wow, new piano bass (and the RMI) look spectacular. 2 gold sparkles basses....crazy, CRAZY!! Dare I ask how you came upon the new one? Also, I never noticed that Ray's bass had the output jack further left than most. What's the story behind that? Was that a feature of the '65 model or just an occasional random anomaly? Hey Chris!!! Thanks. Yes, Ray had the jack just over the low E which seems to only have been on 1965 basses. I'm not sure why they changed this as it helps keep the cord out of the way. The name rail is chrome like, but smoky and not as much like a mirror as the 66 versions and appears to be thicker...perhaps polished aluminium. Most of those also have the pin style hinges on the rear like Ray's. Oh and the RMI I've had for about 3 weeks. 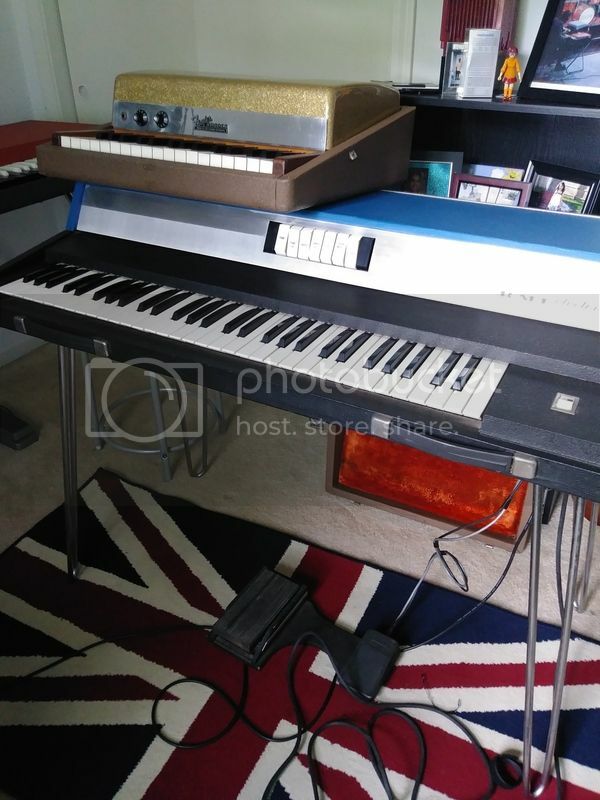 I saw it on reverb for $200 and offered $100 plus shipping and he accepted my offer. It was non working, but cosmetically almost brand new. I got it repaired for $80 so it was a great deal! Btw, I love your videos om You tube. I have the rare acoustic 260 with the 261 power plus powered cabinet which is hard to find over the regular 261 cabinet, but you sir, have the elusive Jordan, The Boss amp. Hats off! Hens teeth! Great story about the finding the new bass. I love hearing that you can still find gems like that in an old antique store. Seeing it in person and deciding to buy it right then and there is a better story than "I bought it unseen from some dude on Ebay." Just when I thought I was set...well, I have something new to hunt for. I have an RMI too but for some reason it's overall output is super low even after dumping $150 worth of repairs into it. Did it come with a pedal that's needed for it to sound right? I'm also missing the legs. Yeah, the Jordan Boss amp took years to hunt down. I'm not sure why they're so impossible to find but I couldn't even find a photo of one on the entire net except for pictures of bands and advertisements in the 60s. Originally I thought maybe they were junk and got tossed but mine feels solid and sounds LOUD. One turned up on Ebay 2 years ago and I jumped on it. Now I'd like to get the slave unit that would feed off the amp like the Doors had but have yet to find one. Also need to get the Acoustic 261 cab to go with my head. The guitarist I play with has one so I play through his sometimes. My favorite set up is the Vox and Gold bass coupled with the Jordan and Fender Bassman which seems like Ray's standard setup from around March to Sept. of 67. Thanks for the kind words on the keyboard / Doors vids. I want to get back to making more but the real world keeps me from getting back to it. I did get a chance to play with Riders on the Storm a couple of weeks ago when Ryan wasn't available so that gave me a reason to brush up again. Good stuff, Chris. I, too, have wondered why the Jordan amps are so scarce. It makes no sense. 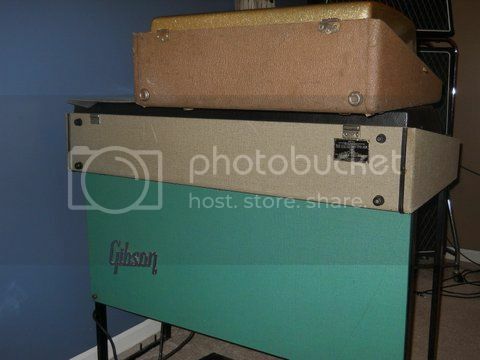 My acoustic 261 is the super rare power plus like most of the ones the Doors had. They are powered cabinets that you can run without a head to add more power. You can tell by the same amber pilot like on the blue strip on the right side of the cabinet that is just like the light the head has. These were made in smaller quantities than the non-powered cabinet. It was on ebay as a pick up only in Chicago with a starting but of $400 and I was the only bidder! My RMI does have the volume amd sustain pedal. The unit looks almost mint, but smelled of mold so i had to give it a good cleaning and that took care of it. It is great having someone else be so into this stuff! 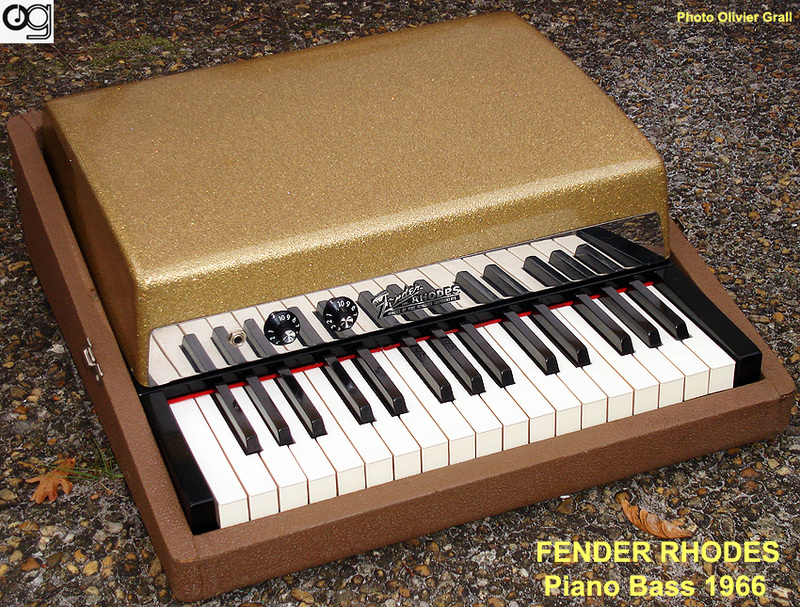 Gold Sparkle top piano bass for sale on Reverb site. $3500...yikes. I saw that one too. Insane. It did look pretty clean though. As for the true Ray spec with the pin style pre -cbs rear hinges and hazy chrome name rail with jack over to the left, I've only seen 5 with those features in addition to my own and one was Ray's.